So THEY Say Watercolor is The Most Difficult Medium. I’m not sure where “THEY” live or pontificate, but THEY have a very large presence in lots of commonly believed “truisms.” And sadly, most folks believe these oft repeated urban myths precisely because of that repetition which has no rebuttal. Here is my response. Just telling yourself that a task is difficult makes it so. Our minds are powerful so you need to get in the habit of talking yourself into expecting good results rather than the opposite. It also helps to be realistic in your expectations. Growth is a step by step process, one building block at a time. No one expects to play a difficult piece of music in one month but somehow that basic wisdom flies out the window when painting is considered. Focusing on the joy of the process rather than the end product will keep the whole experience fresh and fun. If it’s not fun, chances are you won’t do it with any regularity – and that really inhibits growth as a painter. 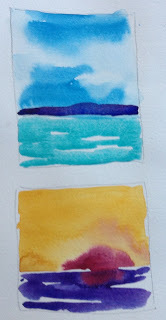 I teach a class called “Beginning Watercolor Bootcamp.” It consists of two days, usually weekends, from 12 noon to 4pm. It has proved to be much more successful than the shorter classes which run several weeks. I’m convinced it’s because on the second day, there is considerable muscle memory. Practice is easier, the paint and brush better behaved and I often hear, “Oh, I get it!” Students then bounce into other workshops with confidence. Earlier I had a hard time getting them to take anything except another beginning class. Here are examples of studies done late on the first day of class. When I tell them that we are about to paint small landscapes, they groan and roll their eyes. But when they are finished, the delight and excitement are contagious. Earlier in the day, they practice several ways to apply paint. Flat washes, graded washes, glazes, wet on dry, dry on dry, wet on wet, charging in color, etc. In this exercise, I ask them to work in either a vertical, horizontal or square format using a high or low horizon line. That insures that they will avoid the half and half division of space. Some of the paint is applied when the initial wash is dry and some while it’s still wet. Sometimes they hold up the paper to get the wet wash to run into areas they prefer and sometimes they touch an area with a repetitive color to bring more harmony, not to mention excitement, to the landscape. Putting paint down doesn’t mean it has to stay there. 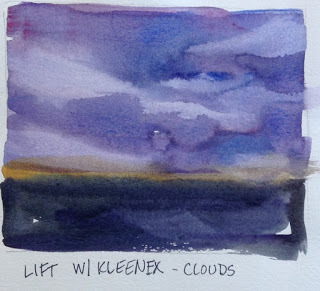 Various lifts are explored such as using a tissue as above or blotting with a textured paper or simply drawing with a wet brush to animate an area. These little experiments are only about recipe card size so there is no hesitation to do several. When I take small mats to isolate each image, sometimes adjusting the size of areas, they marvel at the results. They agree with me that receiving a handmade card is very welcomed and I can see that they just might begin working small and even saving a few dollars in the process. One of the things I stress is that as painters, we never get to that plateau where we think we finally have it all figured out. No Nirvana for painters. Rather it is a continuum where effort and practice are rewarded with proficiency and progress. This is something that can be begun at any age and for most, it’s an activity that is life long. Painters tend to have long lives. I believe it’s because each day has the promise of new discovery, new shapes, new images and the pure joy of discovery. I was privileged to be with Millard Sheets at a workshop near the end of his life. He said he wished he could begin all over again, saying, “Now I know what it’s all about.” Not a month later I was reading a book about Cezanne and his words were almost identical. So if you still think THEY know anything at all about anything at all, toss that thought! Is watercolor painting easy? No. Nothing that is worthwhile is particularly easy. If it were easy, it’s value would be diminished. Is it fun? Oh, yes! So if you’ve always wanted to paint, get out that old paint set and have a go. Find a class and if there is negativity, find another class. Don’t let anyone get in the way of something so wonderful! What a wonderful post!! I am running a beginners class in July so will be talking about watercolour as you have here… the old saying of 10000 hours of practice certainly rings true of painting and you are so right…. the destination isn't important it is the journey which is such a joy and if we ever reached our destination it means there would be nothing more to learn or strive for and how boring would that be? Thank you for your kind comments! Aren't we lucky to open doors? Nice post Judy! I've been painting in w/c for over 25 years and still amazed what else I can learn. It's a life time adventure and I still love it. Barbara- I think we will be learning throughout our lives. Fascinating stuff, this painting adventure! Howdy Judy – I'm a soon-to-be retired adjunct art professor and long time workshop teacher both here in CA and out of state. 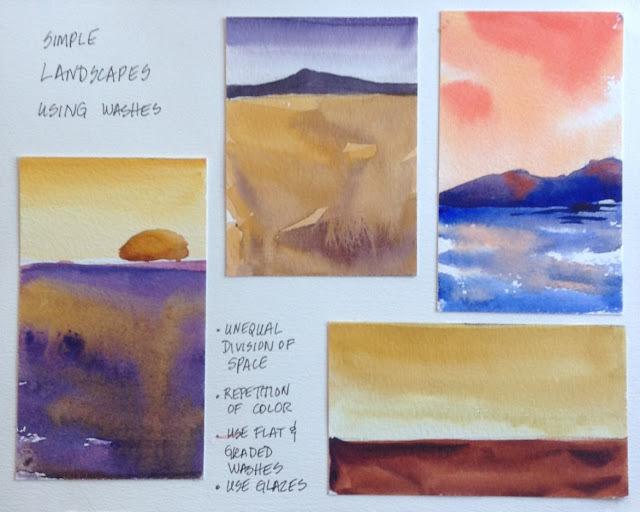 My latest was a five day workshop for the Santa Clara Valley Watercolor Society in San Jose that was sold out with 20 students.I have two very popular workshops that might be of interest to you as far as scheduling into your studio gallery workshop program. You can see the quality of my art at lobenbergart.com and at davidlobenberg.blogspot.com. My email is davidlobenberg@me.com. By the way,the titles of the two workshops are: "California-Vibe Watercolor Portraiture" (scheduled in 2014 in Bend, Oregon and Salt Lake City, Utah) and "Learn The Six Universal skill Sets of Drawing" (another sold out workshop that I taught last month at a University Art Materials store in San Jose). Thank you in advance for your consideration. David K. Lobenberg, Sacramento, CA. So beautifully put, thank you. Sounds like your teaching work is very fulfilling, for you & for your students!